Bump Your Bracket & Win CASH ! Become An Affiliate, Get Auto-Enrolled In ‘Bump Your Bracket’ Contest ! This contest will be run from Nov 15, 2011 7:01 a.m. to Dec 31, 2012 at 9:59 p.m. Pacific Standard Time for new Premium membership sales created during the contest time-period. You win the contest prize by jumping into one of the brackets before the end of this contest. Prize is guaranteed for all affiliates who get into any of the 3 brackets listed here. You'll be eligible for prize from the highest bracket level according to the sales generated during the period of the contest. To be eligible to jump into this bracket, you should bring between 501+ PREMIUM members in referrals during the period of this contest. 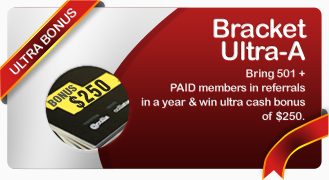 Cash bonus of $250 will be awarded to affiliates who qualify for Ultra-A bracket. Bonus is in addition to the affiliate commission that will be paid for normal sales from referrals. To be eligible to jump into this bracket, you should bring between 251-500 PREMIUM members in referrals during the period of this contest. Cash bonus of $100 will be awarded to affiliates who qualify for Super-A bracket. To be eligible to jump into this bracket, you should bring between 100-250 PREMIUM members in referrals during the period of this contest. 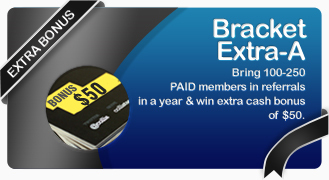 Cash bonus of $50 will be awarded to affiliates who qualify for Extra-A bracket. You qualify for rewards from the highest bracket you jump into, according to the number of Premium Membership sales you generate during the period of this contest. You'll qualify for reward from only the highest bracket you are eligible in. For eg. if you qualify for Ultra-A bracket, then you are eligible for bonus rewards from Ultra-A, but not from Super-A or Extra-A. All sales should be reported from a single affiliate account. You cannot combine sales from multiple accounts, even if they belong to the same individual affiliate. All sales should be from referred members. All sales should be based on Premium membership purchase, NOT credit reimbursements or FREE Premium membership promotions. All prizes will be in US dollar. To get paid, you should have a valid paypal account. All prizes to the contest winners will be awarded by Jan 25th, 2013. This how the contest works:. You are automatically enrolled in the 'Bump Your Bracket Contest' as part of affiliate registration. To win a prize, affiliate must move into a higher sales bracket, as defined in the brackets chart above. You'll get paid the cash bonus from the highest bracket you qualify in. Multiple affiliates can win prizes as per the bracket they qualify in, during this contest. This contest will run from Nov 15th, 2011 through Dec 31st, 2012. Only Premium membership sales reported during this period will be counted towards this contest. ii.the matrigo.com affiliate who signed up to the matrigo.com network on or after Nov 15, 2011 7:01 a.m. Pacific Standard Time, who are eligible for one of the contest brackets defined above (as determined by matrigo.com) during the Program Period, net of adjustments and chargebacks. i.bonus prize money determined by matrigo.com, as per the bracket matrigo.com determines the affiliate falls into during the period of this contest. Adjustments and changes to the bonus are within the sole discretionof matrigo.com. c.“matrigo.com Affiliate” means a person who has enrolled as a marketing affiliate of matrigo.com, agreeing to abide by the standard matrigo.com Affiliate terms and conditions as imposed by matrigo.com from time to time, generated leads for or for the benefit of matrigo.com during the period of the contest and who is not otherwise in default of any agreement with matrigo.com. This contest will run from November 15, 2011 at 7:01 a.m. to December 31, 2012 at 9:59 p.m. Pacific Standard Time (the "Contest Period"). a. Affiliates who will participate in this contest hereby agree that reports from Matrigo and its in-house affiliate sales tracking system shall serve as the definitive record of and shall be the determining factor in the event of any dispute. ii.releasing matrigo.com and any other person or entity associated in any way with the Incentive Program and the Award, as well as their respective affiliates, subsidiaries, directors, officers, shareholders, employees, agents, advertising and promotional agencies from any and all liability arising in connection with the foregoing, including, without limitation, liability arising from the acceptance or use of the Award in part or in whole. Without limiting the generality of the foregoing, each Qualified Affiliate and guest must agree to indemnify and save matrigo.com (and any other person or entity associated in any way with the Incentive, as well as their respective affiliates, subsidiaries, directors, officers, shareholders, employees, agents, advertising and promotional agencies) harmless from any liability for the payment of income tax on account of an Award in any jurisdiction where the Qualified Affiliate (or guest) resides or works. c.By accepting an Award, the Qualified Affiliate acknowledges the right of matrigo.com to use that Qualified Affiliate’s name, city of residence, photograph, voice and image for any advertising or public relations purposes in all media used by matrigo.com and its advertising and promotional agencies, without payment or compensation, throughout the world, in perpetuity. a. Only those matrigo.com affiliates who are over the age of twenty-one (21) years will be eligible to participate in this contest. Notwithstanding the foregoing, none of the following individuals will be eligible to participate in the Incentive Program: (a) matrigo.com employees, their immediate family members or any persons with whom they are domiciled; or (b) any resident of any jurisdiction where the Incentive Program would be prohibited by law. b. Employees of Athena Technology Services Pty Ltd., and its parent, subsidiaries, advertising and promotion agencies, and their immediate families (spouse, parents, children, siblings and their respective spouses) and individuals living in the same household as such employees are ineligible to participate. c.
c. Void in countries, states and other locations where prohibited by law. This Contest is subject to all applicable federal, state, and local laws and regulations. a. Affiliate contestants will be disqualified from the Contest if they fail to comply with the Contest’s Official Rules and Terms and Conditions as well as the Term of Service of the Affiliate Service Agreement, and/or’s Affiliate Terms and Conditions. b. Fraud and abuse relating to the earning of incentives in the contest may result in the forfeiture of any incentives due to the affiliate. Matrigo reserves the right to discredit a sale or disqualify an affiliate from this contest, if our system detects that the affiliate is using fake registrations or is manipulating our affiliate program in ways which are against the terms and conditions of matrigo.com website. c. In the event that a Qualified Affiliate cannot be located, fails to comply with these terms or otherwise has not collected the Award within twenty-eight (28) days following the end of the Program Period, matrigo.com may in its discretion disqualify that Qualified Affiliate and select another affiliate to receive the Award. matrigo.com will not be responsible for any failed attempt to notify a Qualified Affiliate of the Award. a. The Affiliate Manager will notify the winning Affiliates via e-mail on or about January 25, 2013. By this time, all cancelled or reversed transactions has already been considered and computed. b. By participating in the Contest, affiliates/entrants hereby grant matrigo.com all rights, including the right to edit, publish, use, adapt, modify, or dispose of any proper names, likenesses, photographs, and/or city/states without further consideration or payment to the affiliates/entrants online (including on the Matrigo Site), in print, or in any other media (including the Internet) for advertising and promotional purposes for this and similar promotions, without additional compensation, except where prohibited by law. c. If an affiliate/entrant changes his/her telephone number, e-mail address and/or street address after he/she enters the Contest, it is his/her sole responsibility to notify matrigo.com by sending the notice to the matrigo.com’ Affiliate Manager via e-mail address [email protected] before the end of the Contest Period. BY PARTICIPATING IN THIS CONTEST, AFFILIATES/ENTRANTS AGREE TO ABIDE BY THE CONTEST RULES AND TERMS AND CONDITIONS AS WELL AS THE DECISIONS OF MATRIGO BUMP YOUR BRACKET CONTEST ADMINISTRATORS, WAIVE ANY RIGHT TO CLAIM AMBIGUITY IN THE RULES, AND RELEASE, INDEMNIFY AND HOLD HARMLESS Matrigo, ITS SUBSIDIARIES, ADVERTISING AND PROMOTION AGENCIES, AND ALL OF THEIR RESPECTIVE AGENTS, REPRESENTATIVES, OFFICERS, DIRECTORS, SHAREHOLDERS AND EMPLOYEES (COLLECTIVELY, “RELEASEES”) FROM AND AGAINST ANY INJURIES, LOSSES, DAMAGES, CLAIMS, ACTIONS, OR ANY LIABILITY OF ANY KIND RESULTING FROM OR ARISING FROM PARTICIPATION IN THE CONTEST (INCLUDING BUT NOT LIMITED TO ANY USE, MISUSE, OR NONUSE OF THE REWARDS BY THE WINNER), OR ACCEPTANCE, POSSESSION, USE, MISUSE OR NONUSE OF THE REWARDS THAT MAY BE AWARDED. WINNERS AGREE TO ACCEPT THE REWARDS “AS IS”. NEITHER SOUTH BEACH SMOKE, NOR THE CONTEST ADMINISTRATORS MAKE ANY REPRESENTATION OR WARRANTIES, EXPRESS OR IMPLIED. Only active matrigo.com affiliates will be eligible to be part of this contest. All questions or disputes regarding eligibility for joining the Program will be decided by matrigo.com (“Company”) at its sole discretion. All eligible affiliates for the incentives and rewards are subject to the terms and conditions of the Contest. Incentives and rewards under this program will not be valid for any cancelled transaction or any transaction posted but subsequently reversed. matrigo.com reserves the right to modify or update this contest anytime without notice. Affiliates participating on the Program are subject to and must comply with the rules and regulations of the “Matrigo Bump Your Bracket Contest”. Matrigo maintains its stringent verification process for the affiliates who are winners for the sales involved in this contest. All prize winners must adhere to this verification process no exceptions. Each Qualified Affiliate will receive an Award, subject to these terms and conditions. The Award must be accepted “as is”, cannot be substituted, transferred, exchanged or surrendered for cash, except at the sole and absolute discretion of matrigo.com, which reserves the right, at its sole and absolute discretion and for any reason, to provide a substitute of equal or greater value (including, without limitation, cash). Qualified Affiliates will be responsible for all costs related directly or indirectly to the Award not not specifically described above as being included in the Award, including but not limited to tax, sales tax and goods and services tax; all other applicable taxes, gratuities, and all other expenses and requirements not specifically described above as being included in the Award. In addition, Qualified Affiliates may be required to provide an accepted and valid credit card to cover incidental charges (including, but not limited to telephone charges, etc.) The Award cannot be used in conjunction with any promotion or discount. No extensions will be permitted, and any part of the Award which is not used will be forfeited. matrigo.com may, in its sole discretion and without liability, terminate the Incentive Program in whole or in part, without notice, or to modify or suspend the Incentive Program at any time, if fraud, technical failures including any network server or hardware failure, viruses, bugs, errors in programming, or communications or any other errors or other causes beyond the control of matrigo.com corrupt the administration, integrity or security of the Incentive Program or if any other factor interferes with the conduct of the Incentive Program as contemplated by these terms. In the event of early termination of the Incentive Program, a notice will be posted online and a random drawing to confer Awards will be conducted among all matrigo.com affiliates eligible to participate in the Incentive Program. In no event will the number of Awards conferred exceed the available number of awards as specified in these terms and conditions. Personal information gathered about affiliates during the Program Period will be used, firstly, for the administration of the same; and, secondly, connection with any publicity relating to the Incentive Program. The decisions of matrigo.com and its authorized representatives are final as they relate to all aspects of the Incentive Program, these terms and the conferring of an Award. The Incentive Program will be governed by and construed exclusively in accordance with the laws of the NSW Australia Province. Any action arising out of or relating to the Incentive Program will be commenced and conducted exclusively in a superior court within the Judicial District of Australia, in the Province of NSW.